EC stands for Electrical Conductivity, which measures the potential for a material to conduct electricity. Even though most growers are familiar with measuring the amount of feeding that they have to give in ounces per gallon, grams per liter, or any other measuring units used, EC goes a little further than this. When growing, it is important to have a good understanding of what EC is all about and its significance to the grower. An EC meter measures the potential for an electrical current to be transported through water known as molar conductivity (electrolytic conductivity) and expressed as siemens (S). Electrons flow from one set of electrodes to another in water across a space not because of the water molecules but because of the ions in the water. Ions transport the electrons and limit the amount of electrons that can travel the space by the number of ions available or able to transport; the higher the concentration the greater the flow. Pure water itself is a bad conductor, which is why an EC meter will read 0.0 in rainwater, reverse osmosis water or de-mineralized water. In contrast, salty seawater is a much better conductor. When we add nutrients (salts) to water we increase the molar conductive potential for current through water and so increase the EC value (or CF = EC*10). All conductivity measurements are directly affected by temperature and must be compensated for. The EC can be expressed using a number of different units, but the typical unit is siemens per meter2 per mole (S/m2/mole) or millisiemens per centimeter (mS/cm). The mS/cm unit is generally used in Europe as a guide to concentration of nutrients in water. In North America, the conductivity is converted into a count of the ions in the water using parts per million (which can also be given in many units including ppm, mg/l etc.). This is done by converting the EC into a value based on knowing the content ions of the solution. Fortunately, there is a fixed calculation for the relationship between these units, which is given in the table below. Water that contains mineral salts has an EC but not all EC’s that are measured indicate the presence of valuable nutritional salts for the plant. Tap water can contain sodium and chloride that have an EC value but no nutritional value when applied to the plant. Fertilizer is of course made up of nutritional salts. The nutritional value that we add to water is known as EC+ and should be added to the water’s EC. This is how we measure the total EC in our feeding tank. The nutritional salts are solids that are extracted from the ground or released by an industrial cracking process. We dissolve a specific mass (grams) of salts in a specific volume (liters) of water and because of this we can also use grams or liters for the EC unit. Although every fertilizer has its own fertilizing value, it is possible to generalize and say that an EC of 1.0 mS/cm contains up to 1.0 gram of measured salts per 1 liter of water. Salt has the property of seemingly attracting water to itself, a process known as hydrolysis. A pot of salt placed in a cellar will reduce the atmospheric humidity there. In a solution, the concentration of salts will always try to equalize across two different regions of concentrations by water movement to the area of higher concentration. This difference in concentrations is known as the Water Potential Gradient. This property also plays a role in our cultivation through a process known as Osmosis which involves a semi-permeable barrier that allows water to pass but restricts ion or salt movement. When we give a lot of nutrients (high EC) the nutritional salts attract the water in the substrate to themselves. This makes it more difficult for the roots to extract the water from the substrate. So it is even possible for us to create conditions in a damp substrate in which the roots are no longer capable of extracting any more water from the substrate. This is known as making the substrate “physiologically dry”. This results in the plants having no more water available for transpiration (evaporation) to cool themselves against the heat (= light). Even though this is commonly referred to as over fertilization it is actually a shortage of water. With cut flowers such as roses, or with cuttings, a higher EC in the vase or the plug for the cutting can literally draw the water out of the stems. We can see this osmotic process in a U-tube when we separate the two sides with a permeable membrane such as a piece of stem. If we now add some salt to one side the water level on this side will rise because the water with a lower EC will be drawn toward it. This is why we recommend that very little or no nutrients are added at the start. Once the plant material has taken we have to try to build up the plant’s osmotic value (EC) as quickly as possible. Because the plant increases in volume and absorbs water this osmotic value falls. Nutrition in the plant redistributes itself and the plant itself becomes soft and lighter colored. This makes it very susceptible to dehydration (wilting) because the water can easily leave the plant. Giving more nutrition to the roots will show proportionally in the growth. Because the water that is used as a means of transport has evaporated, the nutritional salts will remain in the plant and this will raise the internal EC (osmotic value). Since this has been raised the grower can give the roots a higher EC again. By achieving this positive spiral of EC build-up in the plant, the plant also becomes more capable of absorbing water and retaining it. Because of this the plant doesn’t allow its water to evaporate very easily so it won’t lose the water that it has absorbed too soon. The table given below gives an example of a plant that has lost its water reserves too soon. With plants that are too soft the intensity of the light will have to be reduced or the number of hours of lighting will have to be shortened to prevent a shortage at the end of the day. Even though EC plays an important role in this story it isn’t the only factor that has an influence here. The total climate control around the plant influences the processes that EC is a part of. Building up the EC in the plant and consequently the substrate, should be done taking into account the demands of the plant’s growth. This demand is controlled by assimilation. The bigger a plant you grow the more nutrition it will need. These nutrients are partly locked in the plant and converted into usable amino acids, oils, fats etc. but there is also a proportion that remains in the plant’s sap and this determines the internal EC. Potassium is one of the most important nutritional elements in this process. Once the plant has finished vegetative growth it can still absorb a lot of potassium for the internal osmotic value and the ovaries. The ovaries are not the fertilized “seed”. However, this increasing intake also comes to an end. After approx. 60% of the cultivation cycle the plant will have enough with the stock of nutrients that are in the substrate. The game of nutrient stock verses applied EC now starts for growers. We can use the “bucket” principle to gain insight into, and a good understanding of, this game. While the water in the substrate will evaporate, the salts will not. so in the last weeks of growth, you should - in most cases - stop feeding the plant and only add water. Because if there’s not enough water in the substrate, the EC-value (salt concentration) could rise dramatically. We have a bucket that contains 10 liters of fertilizer solution with an EC of 2.0 mS/cm. This means that the bucket contains 20 grams of nutritional salts (nutritional stock). (2.0 g/l X 10 liters). 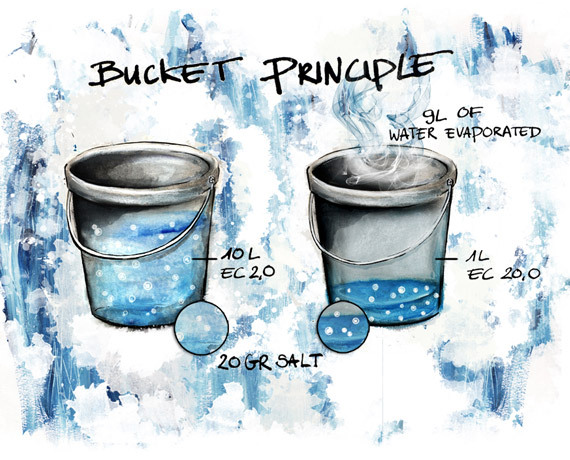 When 9 liters of water evaporate, 1 liter of water remains that has an EC of 20 (EC = 20 grams of salt in 1 liter of water). In reality it will never be as extreme as this and when cultivating with soil there is a further buffering process that binds the nutritional salts to organic substrate particles to some extent, but the principle is still valid. Adding back 9 liters brings the EC to 2.0 mS/cm. So, if we need to maintain the EC between 2 and 4 mS/cm then we have to replenish the water at 5 liters removed. (4 g/l x 5 liters = 20 g, EC = 4mS/cm). If there is a plant in the bucket that has absorbed 5 grams from the solution, we can top this up when giving water if we need to maintain 2.0 EC. If the water dose is 5 liters for example, we should then give 5 grams, or to put it briefly; a water dose of 5 liters with an EC of 1.0 (gr./l) or mS/cm. The goal here, and in cultivation, is to maintain the EC in the bucket. This is the basic premise of fertilizing. We try to hold a certain level of fertility in the container which ensures an adequate supply of nutritive elements is available to the plant. Generally speaking we should lower the EC in the final period. With a system that can be drained we can reduce the nutritional stock ourselves by rinsing out with a low EC. The substrate in drainable systems can be corrected a lot better. In non-drainable systems, the nutritional stock is constantly added to with subsequent applications of feed. Sooner or later, this nutritional stock will reach levels that slow, then stop the ability of the plant to take up water, then will actually cause water to move out of the plant tissues in a reverse of this entire process. As well as being a unit for measuring the fertilizer given to plants, EC is also a climate control mechanism that relates to water absorption. Plants should be started with a low EC, which is then built up as quickly as possible in order to provide for the plant’s nutritional requirements as well as to raise the internal osmotic value in order to build strong plants. The plant requires hardly any further nutrition in the final weeks of cultivation. We only continue to provide nutrition in order to maintain the nutritional stocks in the pot and to keep the EC stable. This generally results in the EC being lowered or even in a weekly rinse (leaching).